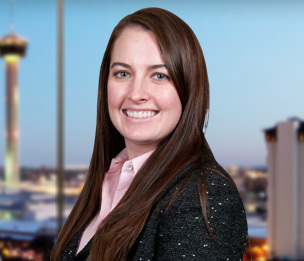 Cassidy Ross is an attorney in Dykema’s San Antonio office who assists clients with a variety of complex legal issues, including energy-related matters, insurance claims, fiduciary duty disputes, e-discovery and appellate matters, among others. Cassidy also has labor and employment experience, having handled EEOC mediations and age and national origination discrimination cases. In addition her litigation practice, Cassidy frequently works with the firm’s oil and gas transactional group in drafting original title opinions, division order title opinions and deeds. Cassidy’s dedication to her local and legal communities shines through her commitment to pro bono efforts. She actively participates in the Karnes Pro Bono Project, which provides free legal services to detainees in the Karnes Detention Center. Through this program, Cassidy has helped numerous women with credible fear interviews and requests for rehearing and is currently representing an Afghan family seeking asylum. In addition to this program, on behalf of a minor child who was a victim of human trafficking, Cassidy co-drafted an amicus brief to the Sixth Circuit Court of appeals that argued to uphold the district court’s award of restitution and addressed both the MVRA (Mandatory Victim Restitution Act) and VWPA (Victim and Witness Protection Act of 1982); the Sixth Circuit upheld the lower court’s award. While attending Texas Tech University School of Law, Cassidy served as a law clerk to the Honorable Les Hatch of the 237th District Court of Lubbock County. She also participated in a five month intensive European study abroad program with Jean Moulin University Lyon 3 in Lyon, France.